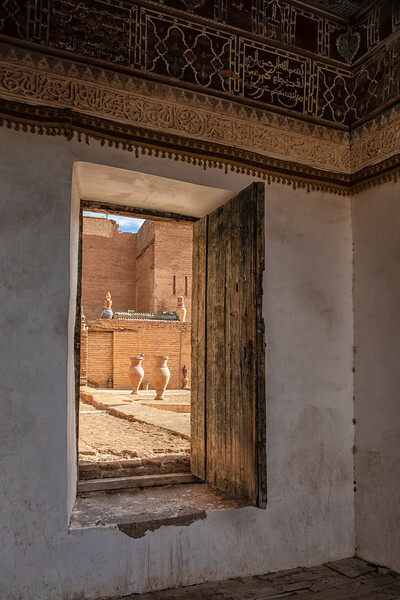 On the first day of our Backroads hiking trip, we visit a riad (a traditional Moroccan home built around a central courtyard) in Tamesloht. Tamesloht is a mountain village about 15 miles from Marrakesh. It is known for its history as a religious center and its zaouia. A zaouia (or zawiyya) is an Islamic religious school or monastery. Tamesloht is also cited as the place of origin of tangia, a staple of Marrakshi cuisine. Our local guide took us on a tour of the home, which is beautifully adorned with intricate carvings, inlaid wood and decorative tiles. We then sat down for a refreshing cup of mint tea and got an introduction to Muslim religion and culture.